Coffee runs thru your veins, from sun up to sun down the coffee pot is full and this is the perfect mug for you! Your own prescription for that sweet caffeine! 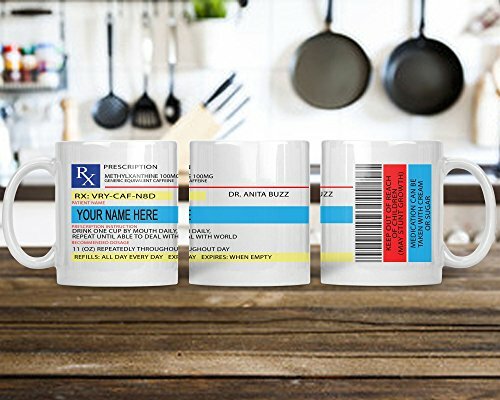 Personalized with your name so no one ever picks up the wrong cup again! Perfect for any coffee lover you know - mom, dad, grandma, grandpa, coworker, aunts or even bff! Give them a gift they will use over and over again! Please leave the name needed on the mug in the message to seller to avoid any delays in processing. This mug is an 11oz mug and the design wraps around all three sides as shown. Top rack machine washable. If you have any questions about this product by DipsyDoodlebug, contact us by completing and submitting the form below. If you are looking for a specif part number, please include it with your message.